There are days I wish I was a multi-millionaire with vast resources, cool regulatory connections, tech-savvy and excellent people motivator. Someone who sees the new regulations for the opportunity it is and the potential in it. If I was, I’d quit my cosy banking job and set-up my own company that provide services to all Malaysian Banks to support the compliance of the new guidelines. Instead of all the banks scrambling to meet the requirements, they can just outsource all their problems to my set-up to run it. One stop solution to all your headaches. Perhaps I am writing this out of frustration because I do not have the resources for it. Or perhaps I am writing this for my own interest, hoping someone like Bruce Wayne takes up the challenge and make all our jobs easier. Maybe some of us can get an offer to join this company. That’s wishful thinking I bet. What would this company / set-up offer to banks? Hmmm where do we start. Compliance with the Investment Account Guidelines. All Banks do not generally set up their operations to work like fund houses where you have fund managers running their investment desks. Neither are there an infrastructure to manage and monitor the fund or portfolio performance, nor having mechanisms to create mark-to-market valuations of the portfolio. Reading the Investment Account guidelines makes one think that the banking model itself has to change to a pure Mudharaba trading house. A dedicated fund house with ready systems supporting the investment requirements and offering their services to Islamic Banks will ease the burden at Banks to develop their own infrastructure. This can be a huge component of businesses in the near future. As BNM place more and more emphasis on the big 3 of Musyaraka, Mudharaba and Murabaha, more and more focus will be placed on building the long term infrastructure to support this. Warehousing infrastructure, including managing physical assets and commodities belonging to the Banks, will support the Murabaha envisioned by BNM. A re-vamp of the credit policies and a different approach to risks assessment will support Musyaraka. Mudharaba will encourage the Bank’s “entrepreneurial appetite” as Banks take a more hands-on approach to investments. 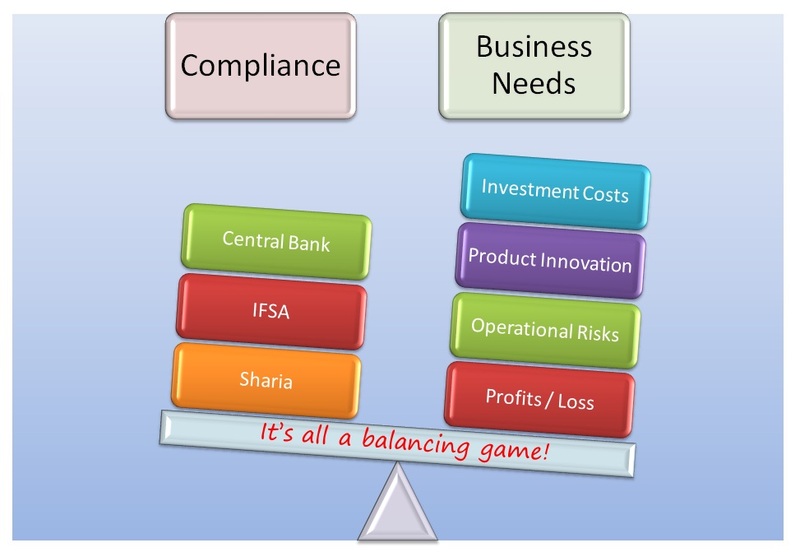 Ensuring a compliant structure and supporting the requirements of Sharia on sequencing, documentation, management of commodities, ownership transfers, usufruct and beneficial ownerships and valuation must be developed for the long run. A company which offers these services, or provides an IT platform for this, are something that can reduce the stress placed on the industry. There a easy lot of opportunities for SPVs to flourish in the Islamic banking market. To support the ownership issues, an SPV can be a useful conduit for the movement of assets which will then create the underlying transactions. Huge deals are done on SPVs. Complicated structures need them. This is a viable legal solution for across border deals. The only question is; what do we do with the SPVs once the transaction is done? Rent it out to another entity, I presume. Either way, SPVs are created for win-win situations for everybody. The IFSA 2013 is like a large pool of compliance that needed development. There are many opportunities out there and with the coming of even more complicated regulations, Banks are always finding ways to meet the requirements set in the regulations. Some will be creative solutions, while others will address the fundamental requirements of the transaction. Whatever they may be, it will only provide possibilities where fortune smiles on the brave. Take that chance. Hopefully, you will succeed to make all our lives easier. This entry was posted in Bank Negara Malaysia, Commodity Murabaha, Guidelines, Islamic Banking, Malaysia, Murabaha, Tawarruq by Amir Alfatakh. Bookmark the permalink.